Grandma was the world’s greatest cook and many people would say this was true. It seemed she was in her best form during the holidays. But what were her secrets? Grandma never went to culinary school or ever worked in a fancy restaurant, but she certainly could have. No, her skills were known far and wide by her family, friends, bake sales for charity and many often strangers that just happened by her home. She used to feed the milkman when milk was delivered; the letter carriers, many a paper boy and girl, and those which mowed her grass, raked her lawn and shoveled the snow from her sidewalks. She never won any blue ribbons at the fair and most likely because, she never tried or ever entered any contest. She thought that was all just for show and she would rather cook for people and not for prizes or recognition. Grandma’s reward was the smiles on so many satisfied faces. Everyone loved Grandma’s cooking and many asked for her recipes, which she was more than glad to share. But no matter how well the recipes were followed, nothing seemed to turn out quite as well as Grandma’s cooking. Several people asked her if they had understood or if she possibly had left something out? 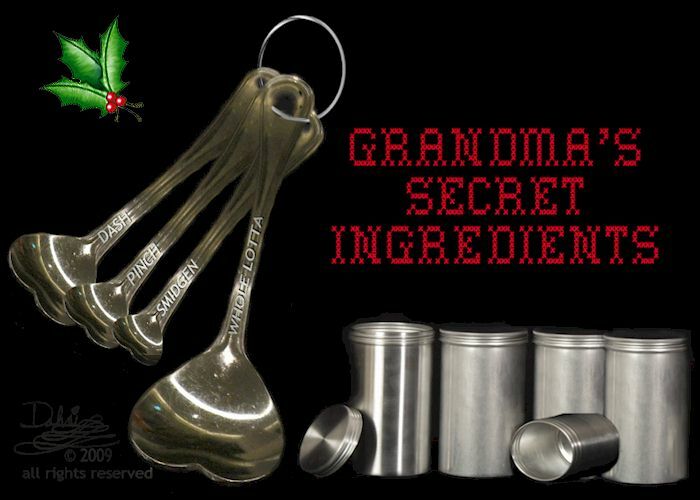 “Oh, maybe I left out the secret ingredients,” she replied, “a dash of this, a pinch of that, a smidgen and a whole-lotta.” Grandma would smile and the funny thing was, no one ever asked her what she meant, if she was just teasing them or ever asked to watch her cook. One day, I came over to her home and Grandpa let me in. Grandma was in the kitchen, cooking as usual. She did not hear me come in or say hello. She was humming another little tune while she worked. I sat down at the table in the back of the kitchen and watched her. Grandma never even knew I was there. When it looked like Grandma had finished with what she was doing, she opened the cabinet door in front of her and pulled out four little plain, unmarked metal spice tins. She opened each one, one right after the other. Next she pulled out some measuring spoons from the drawer below. As I watched her put the spoons into each tin, the strangest thing happened. It looked as if she was measuring out something from each tin with the spoons and sprinkled them over her food, but there was nothing pouring out from those spoons! I wondered about some logical reason for this strange behavior. Maybe I was too far away to see what she sprinkled onto the food? Then again, could Grandma’s eyesight be failing? I shuddered over the next thought that crossed my mind. Perhaps I had just witnessed Grandma having a senior moment or worse, some symptom of dementia, Alzheimer’s or something far more serious? Grandma was still unaware of my presence and she was still humming and happy. She turned to her left and walked to the door off the garage, opened it and disappeared. Just as I was about to turn over the last tin, Grandma walked back into the kitchen and saw me standing there. “Oh, I see you have discovered my secret ingredients,” Grandma said with a twinkle in her eyes and a huge smile upon her face. Note: This story is a work of fiction, but it is based on another story I once heard which may be true. True or not, the principles are true. Whatever we do in life, we should always add in a dash of Trust, a pinch of Hope, a smidgen of Faith and especially, a whole lot of Love! ~ by Dahni on December 22, 2009. What a great story!!! Thanks for sharing it! That was a lovely story Dahni – a bit like Pandora’s box (only with nice things in). Love the heart shaped spoons too!